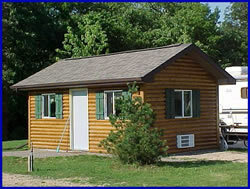 Seven Eagles Resort & Campground offers two very clean decorated log cabins. Both cabins have A/C & Heat and each has its own private shower and rest room. Each cabin has a picnic table and fire pit, and best of all firewood, linen and towels are included with the rental. 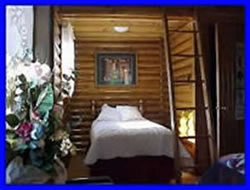 Both cabins have a queen size bed, a single bed, and loft area that will accommodate a family of 2-4 comfortably. The Mississippi Palisades State Park and popular hiking trails, boat access to Mississippi River, an 18 hole golf course. Just 20 minutes north on Route 84 is popular Galena, Illinois with many shops and historic buildings. 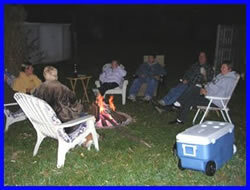 Seven Eagles Resort is only 4/10s of a mile south of Poppy’s Pub & Grub a popular biker destination. Carroll County also offers many Festivals and craft fairs during the summer months and most are within 5-15 minutes from Seven Eagles Resort & Campground.